This post is by a friend (Madhumita Sarkar Das) who travels a lot but does not blog. I have written it down with her permission and approval after she narrated what she saw and felt. The photographs have been contributed by her. I was driving down to Khajuraho with my family for our winter break. Braving the winter chill of a December morning, we set out from Katni with packed breakfast and other munchies. We are a family of nature lovers and I love spotting birds and wild flowers and capture them through my mind’s lens for eternity. I also have a deep fascination for rocks and pre-historic structures so much so that I would often be lost in imagination while the professor lectured on rock forms when I was pursuing my graduate studies. I was specially looking forward to the trip to make a stop at Raneh Falls and get a first hand view of the canyons and gorges of Raneh. I never quite made it here on a study tour since the rest of the class seemed to be united on visiting other exotic locales. After a couple of photo and food breaks we reached the Raneh Falls area about 20 kms away from Khajuraho. 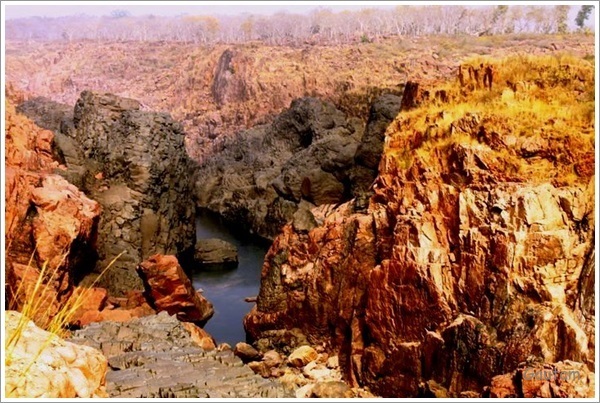 I was taken in by the deep gorges and the layered granite rock terraces of different hues of pink, red and grey created by the river Ken which originates in the Jabalpur area. In some places the gorges were nearly 150 metres deep. Raneh Falls is a natural water fall on the river Ken. There are a series of waterfalls in this canyon which is visible during the monsoon season. In the month of December, we had to be satisfied with the serene and quiet Ken and the mildly effervescent Raneh. We walked around the rocks observing nature’s creations and it soon turned out to be a journey through pre-historic age. It was easy to visualize the works of nature that may have actually taken place millions of years ago when Narmada Rift Valley was formed. 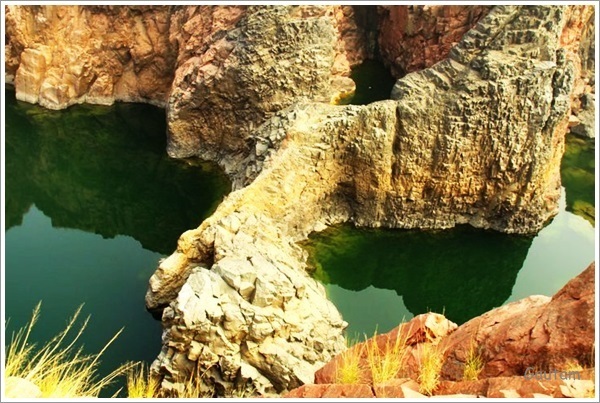 The geological disturbances transformed the limestone into the famed Jabalpur marble. Perhaps these changes were accompanied by the upwelling of lava from fissures in the earth. And thus were formed the rock terraces, gorges and lava fields. My son was in awe of what he saw. I soon found myself narrating an impromptu story to him which was nothing but a romantic conjecture about early man living amid these amazing land forms during pre-historic ages. Perhaps, once the natural forces had quietened down the entire region was covered in dense foliage and early man came into play. On the higher ground-the rocky outcrops of sandstone, seemed to be the appropriate place where humans started living. Perhaps they took shelter under the sandstone ledges to protect themselves from intense changes in natural conditions. The drawings of animals and designs that we see today as rock paintings were created with mineral colours to record their lives and times. I can go on and on… I have travelled to different parts of India but this was a different experience, it reminded me of my girlhood days of poring through pages of geography and actually weaving history!! Wow. Enjoyed the pics and writing. God bless you both. The one who journeyed and the one who wrote! Thank You. Both of us are delighted with all the comments. Lovely pictures and wonderful place. Probably in November we should be around this place . That will be a wonderful time to be there. I am yet to see that area in depth. Hi Sangeeta, Here for the first time but really liked the way to have made the place felt. ” viewing History” the most loved words in this post but the entire post is good. The geographical area you are talking about is known to me though not really explored. The region tends to stay undeveloped and I think just to make us feel the history that you have talked about. Life is a vacation, a desire for many. Thanks Suhas for your wonderful comment. Sometimes I tend to weave history around normal sights. Beautiful..both the pictures as well as the write up! Living in cities I just long to see natural untouched beauty, superb photoes, loved the one with the tribal art on the rock and kudos to both you ladies for showing us such a beautiful part of our country. Thank You. The place is out of this world and there is a Pandav Falls near by which is nature at its pristine best. Lovely post. This place looks like poetry in stone. Hey Thanks. Do let me know which is the best Tree House to spend a week end. Nature has so many things to surprise mankind. Congrats to Madhumita and thank you. Lovely post. Nature is really beautiful… in Bengali it is “darun”. Thanks from Madhumita and Me. In Bengali Oshesh Dhonnyobaad!! Thank You. Will check yours for sure.